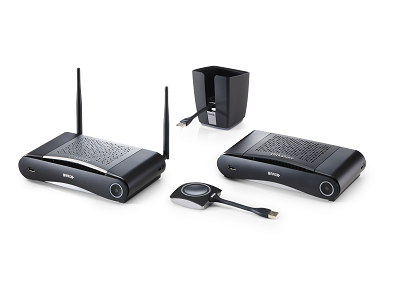 Wireless Presentation Systems allow for cable-free presentation to the projector and/or flat panel displays. IOS, Mac, Android and Windows are supported. This allows almost any device to present wirelessly. A great advantage of this technology, is there is no need to cater for multiple types of cable connectors, needed in hard wired presentation systems. Typically an AV system has to cater for Digital (HDMI, DVI and/or DisplayPort) and Analog (VGA) connectivity. Wireless presentation systems eliminate the need for multiple adaptors and expensive analog to digital convertors / scalers. Hard wired systems have regular failures at input points. This can be from incorrect usage or just wear and tear. Wireless also gives the great benefit of not have a fixed connection position. The presenter is free to locate the presentation PC / Notebook anywhere within the venue. Wireless presentation systems allow for simultaneous, multiple computer connections. This allows for quick switching between presentations without changing cables. Certain systems have a multi-source display function. Four computer sources can be shared on one display. AVC supplies Barco ClickShare, WePresent, Air Media and Kramer VIA wireless presentation solutions. The systems below give you a budgetary indication and guideline to equipment that is available. Prices exclude VAT (15%). A sales executive will contact you to correctly specify a Wireless Presentation solution for your application, budget and venue.